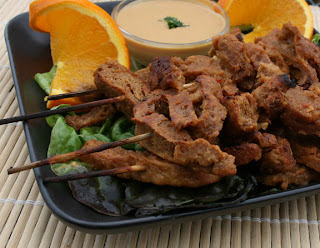 I had one of those “aha” moments the other day while contemplating making seitan satays for dinner. Instead of marinating the seitan to infuse it with satay flavors, this time I decided to put the satay flavors directly into the seitan mixture. To do this, I made a small batch of shortcut seitan —the kind everyone is making these days using gluten flour instead of the traditional (and time-consuming) method made with whole-wheat flour that involves lots of washing and rinsing and kneading. To the basic ratio that is nearly equal parts dry ingredients to wet ingredients (but just a smidge less wet ingredients), I included peanut butter, soy sauce, and garlic powder right in the seitan mixture to give it a rich satay flavor without marinating. I then stretched the seitan into a rectangle and baked it for about 20 minutes. After cooling, I was able to cut it into thin slices and thread it onto skewers. The satays were then arranged on a baking sheet, dabbed with a little spicy peanut sauce and drizzled with a little oil. I then broiled them for a couple minutes, but you could grill them if you prefer. I served them with my favorite quick-and-easy peanut sauce (the recipe is below), and the satays were everything I’d hope for. I made extra peanut sauce to use later in the week, probably tossed with some noodles and veggies. Announcement: The Humane Society International (HSI) recently added a section to their website to promote veg food choices, and I’m pleased to announce that they decided to use recipes from my book Vegan Fire & Spice for their launch. Here’s the link for the recipes — many of them have photos, too. Reminder: The deadline for the Creative Couscous Cake Contest is coming up fast. Don’t miss your chance to win and be immortalized on these pages! It’s simple — just grab a box of couscous and think of your favorite dessert flavors…you may be surprised what you come up with! Start with this basic recipe and then taste to customize it to your liking: add more water for a thinner sauce, a bit more vinegar or tamari for a more salty/pungent flavor, a pinch more sugar if you like it sweeter, and so on. In a bowl, combine the peanut butter, vinegar, tamari, chile sauce, ginger, and sugar, stirring to blend well. Slowly add the water, stirring, to make a thick sauce. Set aside. looks and sounda fantastic. I tried my first batch of Seitan a few weeks ago...and it did not come out as I had hoped. I am going to pick up your book, but would love a couple of pointers if possible on the whole seitan thing. I boiled mine, and my recipe called for "loaves" to be boiled...mine fell apart, and while tasty, was more like a ground. when you bake yours, do you boil it first? or just bake it? There are lots of ways to make seitan, including boiling, baking, braising, and steaming. To make seitan for satays I just bake it. Here is the recipe. If you try it, please let me know how you like it! Preheat the oven to 350 degrees F. Lightly oil a small baking dish and set aside. In a bowl, combine the wheat gluten flour, all-purpose flour, yeast, paprika, onion powder, and garlic powder. Set aside. In a separate bowl, combine the peanut butter, soy sauce, and ketchup. Slowly stir in the water until well blended. Add the wet ingredients to the dry ingredients. Stir to mix well and then knead for about 2 minutes. Stretch the mixture until it is about 1/2-inch thick and place it in the prepared baking dish. Bake for 25 to 30 minutes. Allow to cool before cutting into satay slices. Just wanted to let you know that I came up with an interesting way to use the Seitan for Satays. I cooked it up and made your Satay Sauce then served it as strips over coconut rice (Vegan with a Vengence) for a main dish, with drizzles of the sauce over the seitan and the rice. I plan on using the leftovers in wraps with the sauce, coconut rice and my side of stir fried carrots and green beans. My fiance and I really liked it.